County Recurrent Says: Heads Up and Slow Down ! Please be extremely careful in your driving and car registration & insurance matters. State of California is broke and they are trying hard to squeeze all of us hard to collect money. Effective immediately, if you do not stop at the red light, be ready to pay $ 436 in fines or if you pass a school bus with flashing red signals, you will be charged $ 616. The state of California is going for blood, so be extra careful in driving, you cannot afford messing with them. The highway patrol no doubt is under pressure to issue a lot more tickets than last year with at least 30% increase in fines over 2009, so beware of radar guns, highway and traffic cameras installed everywhere and the tougher enforcement of parking rules. Just for your info, the next time you park in the handicapped zone, even for a minute, you will be looking at almost $ 1000 in parking tickets, so it'd better be worth it. So be careful out there, recurrents ! Please drive carefully. (Custom shortboards on display on ceiling of flagship "Jam's World" store in Waikiki, Nov. 2009). (Retired S.O.L., Bill Powers, January 2010, Mammoth Lakes, CA, kicking back on one of his quads). Just in off the Lifeguard Online Grapevine, courtesy of LACo Recurrent, Ret. and U.S. Navy Seal, Harold Dunnigan, a new CPR protocol that is being touted by a couple of doctors at the famed Mayo Clinic that does not involve mouth to mouth but focuses entirely on constant and non-stop CPR only that is being called "Constant Compression CPR"! Watch the CNN Video below. This is NOT currently the standard op. but could be in the offing, as it were. Stay tuned for specific Department protocol changes, if any. caveat: This Constant Compression CPR is not recommended for children under 8 years old or drowning victims. Buddy Bohn APB: Private Lifeguards Wanted! "On behalf of the Manhattan Beach Badminton Club (MBBC) I'm putting together a hiring list of certified professional lifeguards who would be available for some hourly work guarding mainly kid's parties, club events, etc. The rate is $20.00 per hour and will be paid by the MBBC member who requests the lifeguard's services. Each lifeguard will work as an independent lifeguard (contractor) and will not represent the County or LACOLA. MBBC is located at 516 18th street Manhattan Beach; and has been in MB since 1936, originally on the beach at Marine Ave. Many of our lifeguards and junior lifeguards have learned to swim there, myself included. So, if any of you are interested, please contact me." endnote/p.s. : If Buddy invites you to play badminton and suggests that he doesn't play much..... LEAVE your cash at home ! The Lifeguard Grapevine has assured us that Buddy is the real deal on the badminton court. So spend your money at Memphis On The Beach instead where you can nurse your pride after he soundly defeats you. 10-4. Makuta Was Never This FAST! Woo Hoo! Just in via the Lifeguard Online Grapevine, courtesy of Bill Asturias in Guatemala, who recently heard of former LACo Recurrent Beach Lifeguard Ron Richmond's son, Renny, a 15 year old age group swimmer from Maui, literally blowing away his competition in the Hawaii Varsity Boy's State Swimming Championships held recently in Hilo on the Big Island of Hawaii! Seems Renny has got his dad's Butterfly genes after all. "HILO --- Seabury Hall's Renny Richmond became the first freshman boy from the Maui Interscholastic League to win a high school state title when he took the 100-yard butterfly at the Local Motion State Swimming and Diving Championships on Saturday. Richmond, 15, finished in 49.86 seconds, 0.46 seconds off the state record set in 2002 by Iolani's Hong Zhe Sun, a former NCAA finalist for Stanford and an Olympic trials finalist..."
Keep on swimmin', Renny. We can't wait till you take the LACo Rookie swim along with Makuta's son. Just in from LACo Recurrent, Loyd Pettegrew (Ret. ), Ph.d., now living in Florida, is the following blast from the past photo of two studley Santa Monica City Beach Lifeguards, circa early 1970's. Wow ! Photo Courtesy of Loyd, from the Evening Outlook. Thanks Loyd ! Subject: RE: "Topar Was Never This Fast ! Woo Hoo !" Here is a pic of Renny’s old man in younger days with Miss Santa Monica and some other lunk head who was wearing an earring before it was cool and blowing Captain Richard’s and Tom Johnson’s minds! Will Rogers Tower #18, Winter of 1969-70, by Terry Flanagan, LACo O.L., Ret. (The Photo above shows Will Rogers Tower #18, present day, posted here for story support only. All photos courtesy of Will Maguire). The winter of 1969-70 was one of the wettest ever...major storm after major storm. The creek at Will Rogers 18 was full of debris...rocks, trees, dead deer, even a Ford Mustang all washed out and littered the beach. Eventually it was all bulldozed and spread out on both sides of the creek bed making it unusable for sun bathers ... which turned out to be very fortunate. Bear in mind that this was at the height of the war in Vietnam. Earlier that winter, a naval helicopter had flown south down the beach, hovering over the few stations that were open, lowering a sign on a rope that said "Peace Now", and flying off to the next one for a repeat performance. The following summer, the beaches were packed and at WR 18 the only open space was along the creek where no one wanted to sit. One hot Sunday in early August, in the middle of a crowded day, a helicopter came flying up from the Hughes secret research center by La Ballona Creek and started stalling out over station 18. I was at T 17 at the time and everyone could hear the engine sputtering. The chopper dropped down almost on top of T 18, then somehow did an air bounce and managed to land on the only clear space available...by the creek. I ran back to help as did Herb Thacker and Mark Thompson from T 18. When we got to the chopper, the pilot jumped out screaming that the CIA had sabotaged his helicopter and was trying to kill him. We were trying to calm him down when two Sikorskys flew overhead, with one of them landing! A captain jumped out with two other soldiers and demanded that the pilot go with them. He of course started screaming louder that they would kill him and begged us not to let them take him. Just as the captain grabbed his arm and tried to force him into the Sikorsky, Bud Clark, Captain Cuss himself (RIP), drove up and asked what was going on. The captain insisted he was taking the pilot, and the pilot kept screaming that he didn't want to go. Bud assessed the situation for all of five seconds, walked up to the captain and in his trademark menacing voice said , "You ain't takin' him nowhere!" The captain gulped, got back in his chopper without another word, and the two Sikorskys flew away. The pilot stayed with his chopper until a tow truck came, winched it onto a truck, and he and his helicopter headed back to Hughes. The story never made the newspapers and we never heard anything more about the incident. Just another day at State Beach! Copyright Terry Flanagan 2010. All Rights Reserved. Used here with permission. 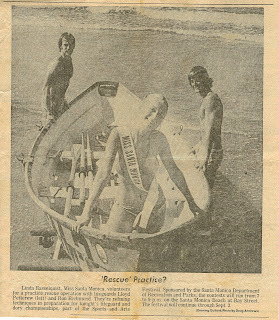 Many Thanks to Flanafish for sharing this Classic Vietnam era Will Rogers State Beach story ! "Car Overboard! ", by Capt. Nick Steers, Ret. *** PLUS *** S.M. Fire Chief Hone To Retire! (Photo Courtesy of Jim Hone and Nick Steers. Used here with permission). "I received a copy of this photo from the Santa Monica City Fire Chief, Jim Hone, himself. He had it in his office all these years. I didn't know it existed until a few years ago. The following is a brief description of what happened. I hope you can make sense out of it. I was working the call car in Santa Monica in the seventies. I don't even remember who my partner was. We got a call that a car had gone over the edge of the short Santa Monica pier, aka Newcomb's pier. We arrived on scene and found that the car was floating in the surf. The surf was pounding. The car got caught between the pilings. It was difficult to get in there since the car was upside down and bouncing off the pilings with each incoming wave. The Fire Department arrived next on scene to try and get the car righted. We were going to wait for low tide. The tide was about to turn around to ebb. Chief Hone (he wasn't the chief yet) whom is pictured next to me in the photo above suggested we use ropes and pulleys to turn the car right side up. We used the pilings as anchors and ropes and pulleys to get a mechanical advantage to try and right the car. Unfortunately, the surf kept hampering our efforts. Finally, the tide dropped enough to get a skiploader and turn the car right side up. We had no reports of anyone being in the car when it went over. We were able to confirm that fact after the car was righted." This message is being sent in support of, and as a courtesy to, the Santa Monica Fire Department. 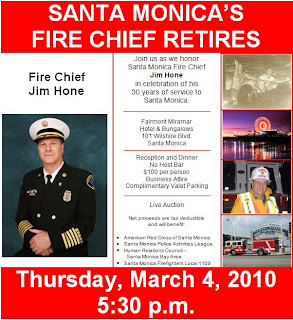 Below is the retirement announcement of Santa Monica’s Fire Chief Jim Hone. 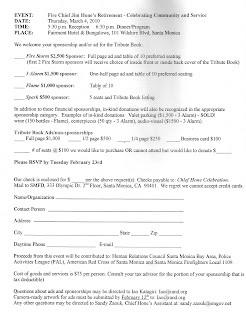 Attached is the remittance form that you may use for sponsorships, ads, and tickets. Thank you. This message, and its attachment, may be forwarded to other Santa Monica residents or interested individuals. For more information about our community e-mail subscriber list, please contact Community Relations by e-mail, or at (310) 458-8474. To be removed from this e-mail list, you may simply reply to the sender and ask to be removed. Many Thanks to Nick for sharing this great photo with us and for giving us the Heads Up on Fire Chief Jim Hone's Retirement Dinner set for Thursday, March 4, 2010. As many of us know, the Santa Monica City Fire Dept. employs and has employed quite a few notoriously heroic LACo Recurrents, both past and present, including but not limited to Ron Brown, Jerry Pillar, Adrian Crook, Dan Matthies, Jon Skorstad, Cody Shirk and others. For those of us who have worked the beaches in Santa Monica, we all are grateful for their professionalism and their always timely Paramedic back up, fire suppression and other mutual aid and support to our lifeguard dept. 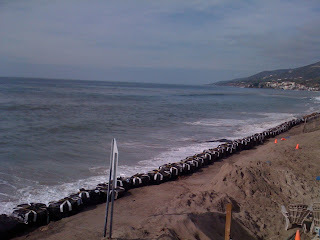 Will Rogers State Beach, Pacific Palisades, Calif.
Wednesday, February 10, 2010 at 0800 hrs. Photo by & Copyright Will Maguire 2010. All Rights Reserved. Used here with permission. "County Recurrent" is pleased to present another gem by our very own Cal Porter, this time about lifeguarding in the 40's. All photos are courtesy of Cal Porter and used here with permission. In 1949, after having worked for some years as a Los Angeles County Lifeguard at Santa Monica Canyon State Beach, and before that as a Los Angeles City Lifeguard in the Venice area, I transferred to the South Bay Division of the county beaches. 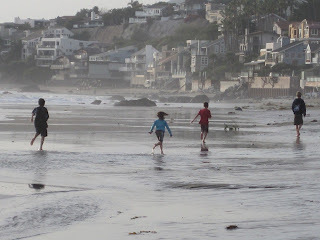 There I enjoyed my assignments at El Segundo, Manhattan and Hermosa Beaches, with their numerous rescues, and then settled in for a longer spell at Redondo Beach before moving on to Zuma Beach later that year. 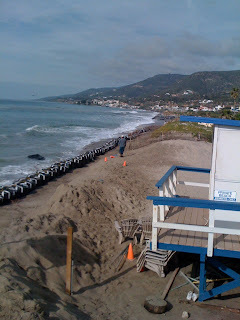 I mainly worked out of the small lifeguard headquarters building on the beach at the foot of Sapphire Street which was there at that time a few blocks south of the Redondo Piers. Our territory extended from the pier south to Topaz and Knob Hill Streets, a distance of about a mile. There were no enclosed lifeguard towers at the time, just the little, open, wooden box types. It was a pleasant stretch of beach, with the grassy, tree shaded Veterans Park as a backdrop just across the boardwalk. I worked with a bunch of great guys and enjoyed my time there. Our busiest section of beach was alongside the Monstad Pier which was connected to the Pleasure Pier and the Horseshoe Pier. The whole complex was referred to as the Redondo Pier or simply as the Municipal Pier. The lifeguard tower there was called Ainsworth Court after a small street that ended there at the beach. 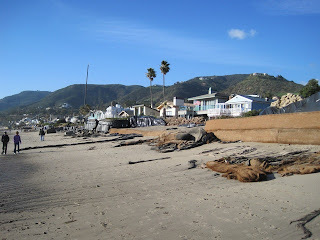 Crowds of people frequented this beach due to its proximity to the popular piers. 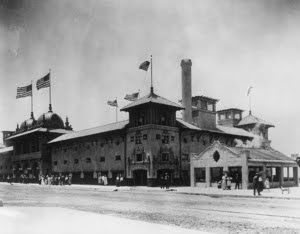 There the Redondo Beach Saltwater Plunge once stood, opening in 1909. I swam in it many times as a kid but in 1943 it was torn down, as were all the other beach plunges when their popularity waned. This is where George Freeth from Hawaii became the first professional lifeguard and probably the first surfer in the United States. 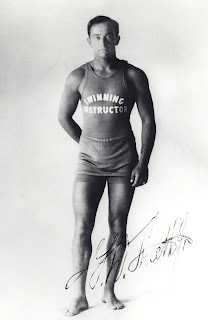 Starting in 1908, “The Man Who Could Walk On Water” as he was called, gave surfing demonstrations for the many tourists arriving at the beach on the big, red streetcars. The King Harbor for small boats just north of the piers would not be there for many years, but at one time 25 cents would take you from the pier by water taxi on a three mile trip to the gambling ship, “The Rex”. It was operated by the underworld notable, Tony Cornero, a recent prison inmate jailed on bootlegging charges. It was eventually raided at gun point, and Tony and The Rex were put out of business for good in 1940. 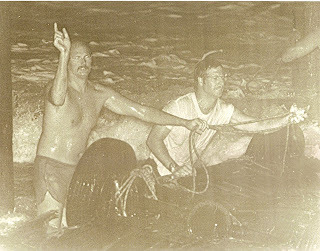 I frequently saw The Rex out there but was a bit young to get involved, although a paddle-out occurred to some of us from time to time in order to see just what went on in that infamous boat. This now leads us to the main idea of this story and to another pier that was once in the area. It was called Wharf #3 or The Lumber Pier. It ran some distance out to sea just south of the lifeguard building where I worked. It was a major shipping pier until San Pedro Harbor took over most of the business. It was demolished in the late 1920’s so I probably saw it but don’t remember since I was a young kid then. However, when they took down the pier they cut the pilings and left the stubs imbedded in the sand that were offshore out in deeper water. Nobody I talked with seemed to know anything about the old pier or remembered it, but those pilings had to still be out there when I was lifeguarding at that beach. And so once I heard that there had been a pier there I just had to check it out. With my swim fins and diving mask one early morning I started exploring in the crystal clear water, not knowing exactly where the pier was. After some time I located it and found that the first sets of pilings were not too deep for free diving, which was good since that’s all we had, as scuba diving was many years away. From then on each day that I went diving on the old pier I would try to go deeper, go to the next set of pilings, and then the next. I found that I was diving much deeper than ever before by gradually increasing the depth over a period of time. What I also found, clustered around and under the overgrown bases of the pilings, were lobsters, dozens of lobsters, hundreds of lobsters, lobsters of all sizes, a bonanza of lobsters. I had been diving for lobster and abalone for years but I had never seen anything like this. I had been diving ever since I was a kid with goggles, before fins and face plates. I had set lobster traps in the waters off Palos Verdes from a boat my brother and I had. I had a commercial fishing license. But this looked like no one had ever touched or trapped this area. At first I would just take a couple home for dinner. Then I started giving them away. Then one day I talked to the owner of the fish market on the Redondo Pier. He said he would take all I could bring him, his local source wasn’t reliable, and I did have a license. So now I would often arrive at the beach long before I was scheduled to work, attach two burlap lobster bags to my floats, and out I would go to the remains of the almost fifty year old pilings. It would take a while, with a great many dives, and there were no wet suits in those days, but in the cold, deep water I would fill the bags as quickly as possible and then haul the lobsters down to the pier. I never saw anyone else dive there, and I didn’t exactly spread the word. This went on for some time that year, and the extra money was good, especially since during that time I became the father of a son who is now over sixty years old and worked as a lifeguard himself for some time. The days turned into weeks, then months. I did a whole lot of diving and time passed quickly. 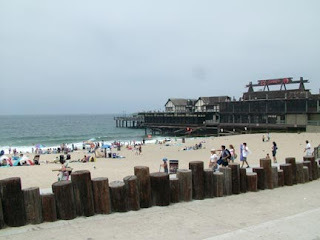 Then the day came when I left Redondo Beach with its old pier and all those lobsters and transferred to the Zuma Beach area in the Northern Division. It was there that I lifeguarded for almost the next thirty years right into retirement. I never dove Wharf #3 again. Tuesday, Feb. 9, 2010: Winter Storm Warning ! An Electrical Storm Is Rolling In As We Type This Blog Post...... and is supposed to be carrying with it rain, wind, funnel clouds and perhaps small tornadoes. So batten down the hatches and find a safe place to sit it out if you can. "County Recurrent": Our Mission ! Since we began to publish "County Recurrent" there has been a welcomed increase in communication and dissemination of relevant lifeguard information, events, etc by the groups affiliated with our tribe of sea warriors. "County Recurrent" applauds this increased collaboration and effort to get the news out to our vast lifeguard community by Admin, LACOLA, LACOLA Alumni, CSLSA and individual lifeguards. The mission here at "County Recurrent" remains to celebrate and honor the recurrent and to share and disseminate relevant lifeguard information to our lifeguard community and to encourage others to do likewise. "County Recurrent", nevertheless, relies on our readership to share news and information with us so that we can keep our readership at large informed. Please continue to communicate with us so that we can keep our readership "in the know". OPT-IN by sending the undersigned your email address and typing in "OPT IN". Please also note that this Opt In feature has been field tested on selected Headquarters personnel and they were able to comply with these instructions. Richard Mark Found Alive At The Dead Sea ! "The attached photo is a Lifeguard station at the Dead Sea. Charmaine and I were there last week. I don’t think they have had many water rescues since it is impossible to sink in the very high concentrated salt water. I have been told it is about 25% salt. The other photo was taken when we were swimming in about 10 feet of water. It’s like floating on an aircraft then actual water. I was surprised to learn that the Lifeguards in Israel make rescues with a ring buoy just like we did a 100 years ago. Perhaps this “LACo Lifeguard Camel", can be utilized on crowded beach days at Santa Monica." "You have my permission to publish the photos. 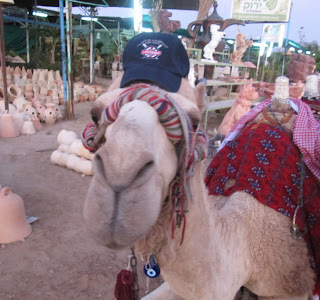 I hope all of your readers enjoy the Camel photo. The trip was really very special. It is truly the cradle of our world civilization. Everyone in their lifetime in this world should have the opportunity to go." "Here is one more photo of the what the coast line looks like (below). It was taken near an ancient Roman city where King Hared built his summer home more than 2000 years ago. The area on the beach is where they had (it is still there) Roman chariot races, fed the Christians to the lions and where Gladiators fought to the death. Not exactly the easy beach life we are used to." H I L A R I O U S photo of our very own LACo Recurrent Camel ! Classic ! "County Recurrent" is pleased to bring you the following exceptional photographs by O.L. 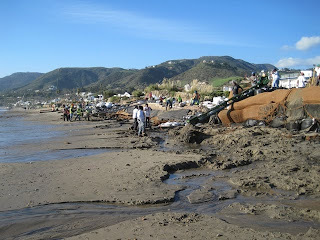 Steve Hotchkiss taken this past week on Broad Beach in Malibu showing the damage to the beach and beach homes cause by the recent late Jan. 2010 high tides in combination with the El Nino 2010 storm surf. 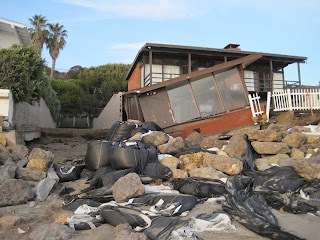 The first series of photos were taken by Steve on January 30, 2010 during the 6.78 tide from Malibu West, aka Trancas. 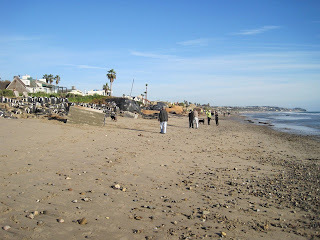 The next set of photos were taken by Steve during the -1.5 low tide on Jan. 28, 2010 which shows the damage to Broad Beach. 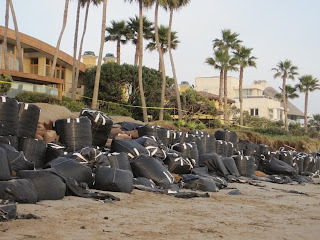 "This is the (beach preservation/restoration) program the Broad Beach HOA announced to our (Malibu West HOA) last week. 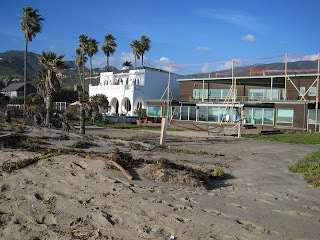 We have the Beach Club on Broad Beach with about 100 feet of beach frontage and are not part of their HOA. The club is owned only by the Malibu West HOA members. 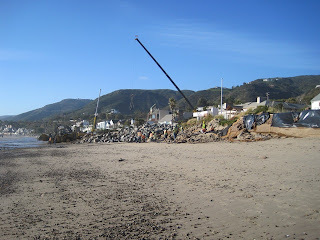 The Broad beach HOA (AKA Trancas Property Owners Association) is starting on their temporary boulder permit. They will become permanent with final permit. As part of the final permit they they will place larger 2-4 ton boulders over these and then sand over those to create a planted restored dune along with additional State owned beach forward of the dune. This will also require a regular sand replenishment program to be funded by an assessment district based on per foot of frontage of a property. As part of the temporary permit they had to take out a bond that will pay to remove them if final permit is not issued. At this time our club is not involved. 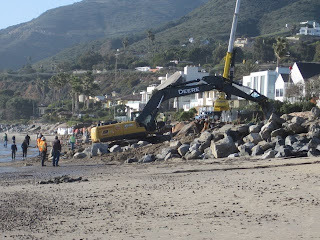 "Malibu residents seek a narrow escape for Broad Beach"
*** Many Thanks to Steve Hotchkiss for sharing these great photos with all of us !